Is the growth in public spending on health making Medicare unaffordable? Just because the Government says something, doesn’t make it true. The reality is that in the coming decades, spending on healthcare will grow but incomes will also grow. Households will decide for themselves how to spend that real income growth but it can be anticipated that as we get richer we will be willing to spend more on maintaining our health.This increased spending can be done as individuals in a user-pays system or it can be done as a community in the form of a system of universal insurance such as Medicare. Either way, health care spending will grow and someone will be paying for it.The difference is, in a highly privatised, user-pays system there will be winners and there will be losers. This is what has happened in the United States. Excellent care is available to those who can pay for it (or insure against it), but many who fall ill cannot afford care and they and their families suffer terribly as a result. Never forget also that the highly privatised US healthcare system costs far more and delivers far less than systems based on universal insurance. We have an ageing population. Don’t we need to privatise more of Medicare so we don’t bankrupt the government? The overwhelming evidence is that the ageing of the population will not have a major impact on the sustainability of Medicare. Most of the growth in costs in health can be attributed to developments in technology and changes to practice. The evidence shows that the impact of ageing on this growth in costs is small or potentially insignificant. That is not to say that the health system should disregard the implications of the ageing of the population. There will be a rise in the burden of chronic diseases and it will become increasingly important to find more efficient ways of managing chronic illnesses. This will require more emphasis on primary health care and better, more cost-effective integration of health care. There is nothing about these imperatives that demands a winding back of the universality of Medicare or increased private funding. Won’t privatisation and competition lead to greater efficiency? Most people understand that market forces don’t deliver efficiency in health. We need to look no further than the US, the health system most heavily exposed to market forces to see how the market fails to deliver efficiency: among advanced economies, the US spends the most on health care on a relative cost basis with the worst outcome1. There are a number of characteristics of health care that make it behave differently to other goods and services under market conditions. It is very difficult and rare for consumers of health care to possess enough information to make rational, independent judgments about their health care. We are almost always dependent on the advice of providers and private providers have an economic incentive to maximise returns on their investment. Private insurance is much more susceptible to inefficiency. A single payer system such as Medicare is far more efficient. Why shouldn’t wealthy people buy better health care if they can afford it? The government’s line that changes are necessary to ensure wealthy Australians pay more for their health care is untrue. They already contribute more to funding Medicare through the progressive taxation system. If the government was genuine about this issue they would be committed to maintaining means testing of private health insurance rebates or scrap them altogether. It is also important to note, however, that the public and private systems in Australia are not perfect substitutes for each other and therefore all Australians still rely on Medicare to some degree. This is a critical feature: if all Australians rely on the same health system, then all Australians have an interest in ensuring that system is properly funded and of high quality. We reject the argument that Medicare should be reduced to a safety-net for the poor. This would inevitably lead to a two-tier system with substandard services for the poor. Calls to improve ‘safety-net’ services would be easy to ignore because the people who would rely on it are not politically influential. 1 Most Efficient Health Care: Countries, Bloomberg. We already have a mixed public/private system. 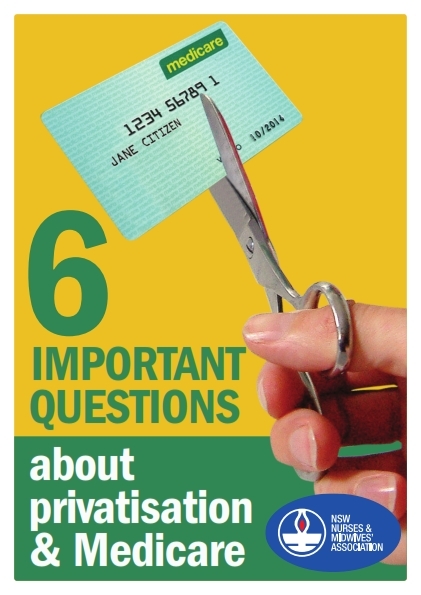 What is the big deal if the balance shifts a bit further toward privatisation? The introduction of Medicare was strongly contested and opposed by the Coalition from 1983. It was only after the Coalition’s fifth straight successive defeat in the 1993 federal election that Howard committed the Coalition to retaining Medicare because he accepted the reality that the Australian public valued Medicare. Moves towards privatising elements of healthcare currently covered by Medicare are a stealth strategy of incremental cuts to re-form Medicare as a safety-net for the poor. Liberal leaders like John Howard, Tony Abbott, Campbell Newman and Barry O’Farrell all know that their parties are unelectable if they state their opposition to the universality of Medicare. Instead, while proclaiming they are the “best friends Medicare has ever had”, they have adopted strategies of incremental cuts that are designed to gradually erode the broader public’s confidence in, commitment to and support for Medicare. Unless we stand up and fight these moves, a tipping point will be reached and Medicare will be re-cast as merely a welfare program for the poor. Increased waiting times in the public sector as doctors have an economic incentive to serve private patients. Incentives to maintain long public waiting lists in order to increase the attractiveness of more lucrative private care. How will the private operators of the new Northern Beaches Hospital, which will provide both public and private beds, deal with the temptation to create circumstances that optimise the attractiveness of their more lucrative private beds? Ethical questions when entrepreneurial doctors refer patients to private care in which they have financial interests. Growth in input prices due to competition between the public and private sector. In the public sector this leads to either a reduction in the provision of services or the need for public spending growth to maintain previous levels of service. Privatisation leads to lower pay and conditions for the nursing and midwifery workforce. What is the solution to the funding of health? There are a multitude of changes that can be made to make the health system more efficient, including better use of the skills and capabilities of the nursing and midwifery workforce. If extra revenue is required, we believe that a financial transactions tax should be considered. There are currently billions of dollars that are being pushed around by financial transactors who are avoiding the responsibility of paying taxes. Financial transactions like stocks, bonds and other financial instruments are being traded around the world at a high volume, yet not a cent of tax is being paid on them. This tax is called a FTT or better known in many parts of the world as the Robin Hood Tax. Countries in Europe are signing on to an FTT, with growing support for it in the US as well. If Tony Abbott wants to fund health, then he should get financial institutions to pay their fair share.